The Mopinion team is committed to providing the best possible feedback analytics solution out there; an objective which requires constant improvement and innovation. Thanks to the feedback of our customers, we’re happy to announce the release of several updates and new features within our software this month! The process of adding tags to feedback items can be pretty labour intensive. Users had to select items in the inbox and then add the tags manually, if they matched certain conditions. However, now Mopinion offers automated tagging. 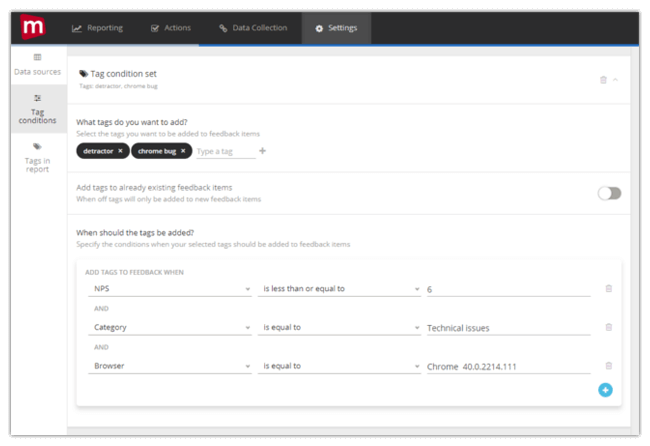 This feature enables users to quickly specify conditions in which tags should be added to feedback items. These parameters can contain any feedback value and can include as many conditions as needed. The conditions can also be combined infinitely – making tag assignment rules as specific as the user would like them. Tags will automatically be added to the new feedback items which match the specified conditions. Users also have the option to add tags retroactively (e.g. to older items as well). This means users can quickly rework the tag structure for a report. 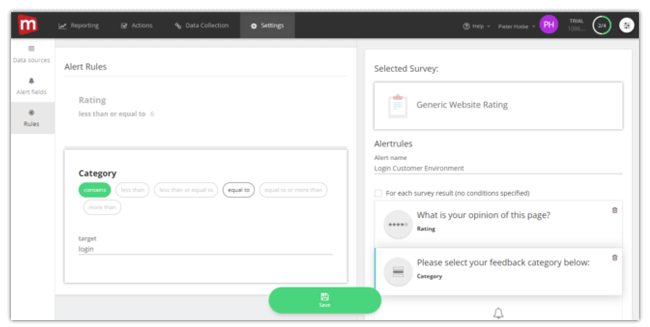 If feedback items from the survey ‘General website’ contain a rating lower than 7 and the url contains ‘/checkout’, add tags ‘Contact user’ and ‘Low score’. If feedback items from the survey ‘NPS Form’ contain an NPS lower than 6 and the category selected is ‘Bug’ and the browser was ‘Chrome’, add tags ‘Detractor’ and ’Chrome bug’. 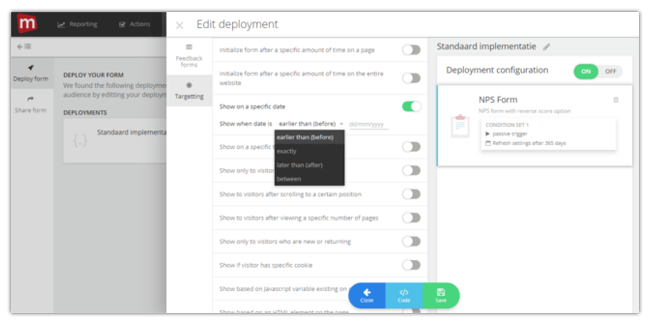 Automated tagging is combined in one handy configuration builder in which a user can easily and quickly set up the parameters and conditions for automated tagging per report. We’ve also added a tag management area in the configuration builder, under the ‘Tags in report’ menu item, where users can quickly view all tags used in the current report and delete them from all feedback items that they’ve been applied to – if need be. With this new feature, users can now easily ‘stack’ (or combine) multiple criteria that will trigger an email alert. 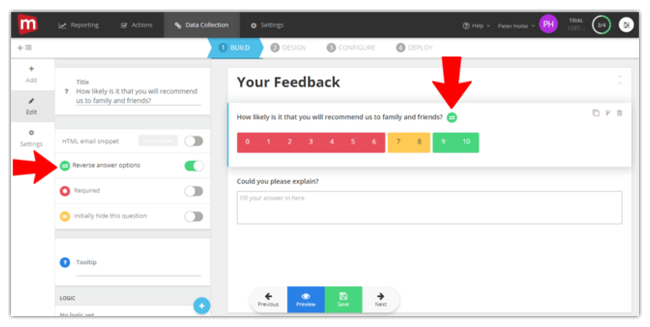 For example, if you want to be alerted of feedback with a low Customer Effort Score (CES) that also includes an email address, this is now possible to set up. Another example might be feedback with a score lower than 3, a comment containing the word ‘bug’ and a URL containing ‘shopping-basket’. 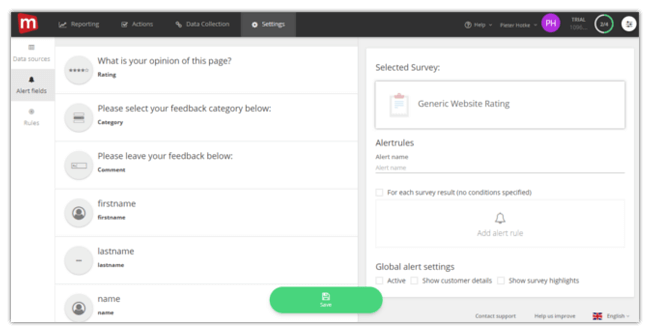 Once you’ve selected the survey, you will select the question element that you would like to add an alert to (under ‘Alert fields’). Our new Google Analytics (GA) plugin allows users to easily track GA analytics parameters by adding their UA-code to a feedback form. GA will then automatically be loaded into the form with the matching UA-code, enabling the users to track all regular GA parameters (such as session duration, opens, or bounce rates) from GA itself. This can be set up via the ‘Advanced’ tab within the ‘Configure’ tab of the form builder. Mopinion has added two new trigger options in the deployment editor: ‘Show on specific date’ and ‘Show on specific time’. With these trigger options users can set their forms to display during different time periods. They can set their form to display ‘earlier than’, ‘exactly’ or ‘later than’ a specific time or date. Or they can specify a range of dates or times for the form to show with ‘between’. For instance, the form can be shown between 30/11/2017 to 5/12/2017, or alternatively between 2:00 PM and 5:00 PM. The time and date triggers can be combined as well. Previously, users could only make use of one scale for scores such as GCR, NPS, CES and CSAT – ranging from 0-10 (negative to positive). However, due to the fact that a lot of companies tend to formulate scales ranging from 10-0 (positive to negative), we have added this option in our form builder. In other words, users can visually reverse the scale. This can be changed in the options settings for a question element.